Neuro-scientist and Nobel Laureate Torsten Wiesel is pushing for the use of science to promote peace in Southeast Asian countries. Like the legendary physicist Albert Einstein and several other acclaimed scientists, 1981 Nobel Peace Prize winner for Medicine professor Torsten Nils Wiesel has dedicated most of his life as a messenger of peace through science. The 75-year-old Swedish ophthalmologist and neuro-scientist is using science to make revolutionary breakthroughs in visual perception and in helping people all over the world benefit from his various advocacies. Dr. Wiesel shared the mission that he and several other scientists ahead of him have been working on to promote peace for centuries in a public lecture called “Science for Peace” held recently at the De La Salle University in Taft, Manila. The event was part of the program “Bridges: Dialogues Towards a Culture of Peace”, organized by the International Peace Foundation. 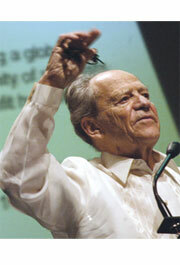 Before an audience composed mostly of high school students from various science high schools, the academe and government leaders from the education and science sectors, Dr. Wiesel underscored the need for the Philippines to provide more resources for education, particularly for science and technology (S&T). Dr. Wiesel presented his opinion to President Arroyo during a courtesy call at Malacañang recently. “I told your President that I feel strongly for governments to provide more resources for education and for science and technology because the future of the Philippine economy relies on this. Agriculture, today, is less important. In order to produce jobs, they have to develop new industries,” he says. Dr. Wiesel says he is pleased to hear from President Arroyo that the Philippine government is now investing a great deal of money for scholarships and schools, as part of its program for education. Although Wiesel avoided to discuss politics with the President, he feels that one of the biggest problems the country has on science is primarily because of too much focus on politics. “I’ve been here only for a few days and I don’t want to make statements that could be misleading. But my impression is that, there is too much emphasis on corruption and no real issues in terms of science, economy and development. I haven’t seen (or heard) your presidential candidates voicing out concrete measures/programs for the future of your country. Instead they all haggle each other for corruption,” he laments. Dr. Wiesel also felt the country’s broadsheets are very narrow in scope, of its news. “Reading your newspapers, I get the feeling that it is very narrow. Your government and the world isn’t presented very well in your newspapers. It’s very local. It’s part of this problem. If you want to place the Philippines in the world at large, you have to inform the reader that you are a part of the world, of the global environment. Don’t just talk only about your own problems,” he reasons. Although science is also to blame for the weapons of war that has wreaked havoc in several countries around the world for the past centuries and until now, Dr. Wiesel has put in a positive light on the various accomplishments of his predecessors who have used science to foster peace. Wiesel even pointed out that some of the scientists who participated in the development of the atom bomb became the main advocates against their use and proliferation. 1962 Nobel Laureate Linus Carl Pauling has been looked up to by many scientists as a role model for peace. He succeeded in having the nuclear test ban approved by major countries after a decade-long campaign against all warfare. Andrei Sakharov, 1975 Nobel Peace Prize winner, was involved in the creation of the hydrogen bomb but eventually fought against the government’s nuclear and social policies. Jody Williams, 1997 Nobel Laureate and the International Campaign to Ban Landmines contributed significantly in the banning and clearing of anti-personnel landmines. Other crusaders for peace include 1970 Nobel Laureate Norman Borlaugh (Green Revolution through the increase in cereal, wheat, rice and maize production); 1986 Nobel Prize winner Elie Wiesel; and organizations such as the New York Academy of Sciences, Human Frontier Science Program, and the Israeli-Palestinian Science Organization. Dr. Wiesel began his prolific scientific career in the Carl Gustav Bernhard’s laboratory at the Karolinka Institute in Sweden where he obtained his medical degree and practiced his teaching profession. In 1959, he joined Harvard University and began his pioneering work on the neural basis of visual perception. Along with Prof. David Hubei, Wiesel came up with studies “showing how visual information collected by the retina is transmitted to and processed in the visual cortex of the brain. Their experiments have significantly expanded the scientific knowledge of sensory processing, were important in the study of cortical plasticity and paved the way for the understanding and treatment of childhood cataracts and strabismus." As president of the Rockefeller University in 1983, he continued to lead in the conduct of vanguard research in key areas of biology, chemistry and physics. Dr. Wiesel also shared his expertise by leading various organizations and institutions like the International Brain Research Organization, Human Frontier Science Program, and the Torsten Wiesel Research Institute. But apart from his accomplishments in his medical and scientific career, Dr. Wiesel says he is most proud of his work as a global human rights advocate. After seeing what happened to Germany under the hands of Adolf Hitler, Wiesel, then a young student, vowed to make it his lifelong mission to help people fight for their rights. He worked tirelessly to fulfill this through his involvement in the National Academy of Sciences, International Human Rights Network of Academies and Scholarly Studies and the Israeli-Palestinian Science Organization. Dr. Wiesel’s lecture is the latest in the series of lectures under the “Bridges” program which aims to facilitate and strengthen dialogue and communication between societies in Southeast Asia. With these discussions, organizers hope that governments through its universities and institutions will be able to build bridges with the Nobel Laureates, through the sharing of knowledge and expertise and in the creation of research programs and other orms of collaboration.